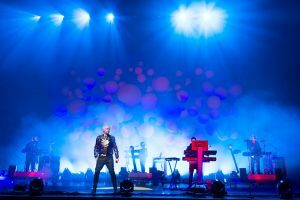 The long life of the Pet Shop Boys – two decades and counting – is a continuing surprise, even to the group itself. Other pop successes of the 1980s have fallen away, split up, sundered through acrimony or addiction. Yet this unlikely and now middle-aged pair remain. This month, the National Portrait Gallery is devoting an exhibition to them and Thames & Hudson brings out a doorstopper collection of all their images. This in a year that has seen another world tour, another album – and yet another incarnation in a manner which would put David Bowie to shame. I was introduced to Tennant one night in Soho in the mid 1980s. As we paced beneath the streetlights, I suddenly had an inkling of what it was like to be a Pet Shop Boy. To be always recognised for what you are, or what people think you are. It was like walking into one of their early videos – directed by Eric Watson, a man sometimes described as the ‘third Pet Shop Boy’. The Pet Shop Boys’ image derived not from other pop groups, but from fine art and film. And of all the possible role models, it’s the names Gilbert and George that come first to mind. Tennant and Lowe acknowledge that the East End artists – who are never seen apart, always dressed in identical suits – had a tangential influence. The key to the Pet Shop Boys’ enduring appeal is the intelligence which they apply to the business of being pop stars. They are serious, even when wearing metre-high dunces’ caps or silly wigs. They are forever accused of irony – usually by journalists who resent the fact that Neil Tennant was once one of them (on Smash Hits). But just as Tennant and Lowe’s music is often directly and affectingly emotional, so the means they employ to promote it – those masks – are valid artistic gestures. For their first tour, MCMLXXXIX in 1989, Derek Jarman produced decadent, lush costume and film designs: Tennant as a caped, crowned pope and Lowe as a medieval jailer draped in chains. It was the world of ‘It’s a Sin’ brought to life. Yet this paled in comparison to the operatic sensation of the ‘Performance’ world tour in 1991, for which Tennant and Lowe enlisted the talents of David Fielding and David Alden of the English National Opera. Not since Bowie’s ‘Diamond Dogs’ tour had such spectacle been wrought out of the marriage of rock and theatre. David Fielding’s further designs for Pet Shop Boys would take the group to another level. Using computer-generated imagery, and working with the video director Howard Greenhalgh, the pair become cyber-versions of themselves, in a manner that echoed Kraftwerk’s robots, and latterly, Jamie Hewlett’s cartoon Gorillaz. advertisementYet perhaps the strangest and most beautiful image the Pet Shop Boys have yet achieved was the samurai boot-boys of 1999’s Nightlife album and tour. Dressed in kabuki make-up and spiky wigs (as though Andy Warhol had put his fingers in an electrical socket), skirt-like culottes and boots, the pair were photographed with sleek metallic Weimeraners straining on leashes. To launch this look, they hired the Gothic interior of Gilbert Scott’s Midland Hotel in King’s Cross, where Tennant and Lowe were to be found seated on a glass-floored platform lit from below – a direct reference to the final sequence in Kubrick’s 2001: A Space Odyssey. On stage, they performed on a set designed by Zaha Hadid, the most radical of all modern architects. Since then the group has reinvented itself in a manner familiar to other masters of the arts – from Oscar Wilde to Noël Coward, from Bowie to Madonna. And like those artists, their style is an accurate reflection of our age.